Payment options : Completely free. Customer support : contact form and email. Welcome to Searchlotto! The next platform in our online lotteries review series. This time we will review a completely different service. First of all, Searchlotto.co.uk is a search engine powered by Yahoo! The combination of this search engine with the online lottery world works this way: You open a free account and set their engine as your default one. Once you perform 25 searches with their services you will be entitled to a free syndicate lottery ticket at EuroMillions or the UK national lotto. Is simple and free, but the service is only available for UK residents. As a result, you might not find it useful at all. Reviews at top10bestonlinelotto.com are intended to help users and to show all the features each platform offers. As a result, users can choose the best platform base on the most important offers and offer products. Encryption of data and transactions. Level of security for the users. Lotteries available at the site and syndicate mode. We also check the side games offered at each brand. What are the languages available on the website. Furthermore, design, navigation and user experience tests. Can you play or navigate from mobile devices? We check desktop, tablet and smartphone functionality. Nothing like getting a welcome bonus, discount or promotion. We review all the promotions of the platform. Customer support available channels and quality of service. How to get in touch with the platform in case of questions or issues. Since Searchlotto is a search engine, it will not get any payment methods information from your side. 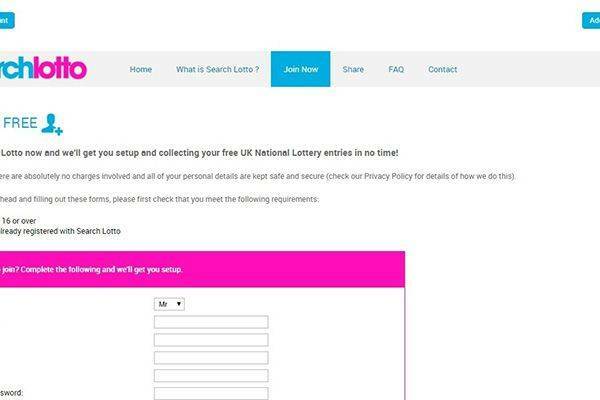 Regarding your searches, searchlotto.co.uk clearly stated they will use your search data without linking it to your profile. This means that third parties will get statistical data of your searches and navigation history, yet they will not get the personal information of the user. Cookies are used by the site in accordance with all the regulatory rules and you can’t deny them to use them. Since Searchlotto is a search engine, the main service they provide is web searches. As a way to stimulate users to use their platform, they provide for the first 25 searches a free syndicate lottery ticket for UK National Lottery or for EuroMillions. As a result, you will not able to pick any other lottery or mode of playing. Furthermore, side games are not available. 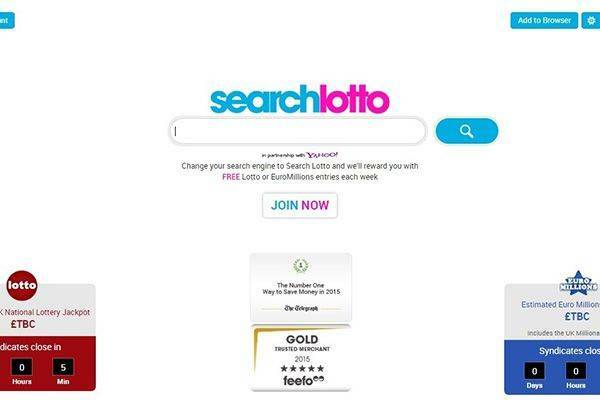 SearchLotto.co.uk website is available only in English. While you can set your language preferences in your mother tongue, still all the website will be displayed in UK English. The site design is very simple, with a search box and two boxes with a countdown for next UK Lottery and EuroMillions draw. That’s all, no images, no designs, just a search engine with a lotto twist. Searchlotto search engine can be used with any browser you can imagine from your desktop, tablet or smartphone. For mobile devices, you will find an iPhone and an Android app you can simply download. Since this is a search engine, you will not find any difference between the different operating systems or devices. You will be able to perform searches on any browser. Just open an account, set searchlotto as your default search engine, perform 25 searches and get your free syndicate lotto ticket. Tablets will navigate without any difficulty on the website. Just perform your search as in your desktop. You can download the Android or the iOS app at your smartphone or simply proceed with your browser as you usually do. Seems like all searchlotto.co.uk usage is a promotion. Since you will get a free syndicate lottery ticket just for using their search engine we can take this as a welcome bonus for new users. You might ask yourself what they are earning? why to give free tickets? As you can imagine, they take back their money through selling advertising that will appear at your browser. Use the contact form at the website in order to open a ticket with your question or issue. First of all, as we already mentioned, searchlotto is a search engine powered by Yahoo! Hence you will get the same results using any of this two web search platforms. The only, big, difference is that performing your searches at searchlotto.co.uk you will be able to get free lottery tickets. While this offer can be very attractive, I still will continue to use my favorite search engine. Furthermore, when looking for online lottery tickets I prefer variety of offer and modes than a single free ticket. Consequently, just for giving free tickets for performing searches we give to searchLotto a rating of 2 over 5. Is searchlotto a scam? They will keep your personal data safe? Are they really going to give you a free lottery ticket? First of all, your data will be use like any other search engine use it. They will use your navigation history to show your relevant advertising matching your searches. In conclusion, the worst scenario is performing the 25 searches and not getting the free ticket. We didn’t try it, and we will understand if you don’t want either.